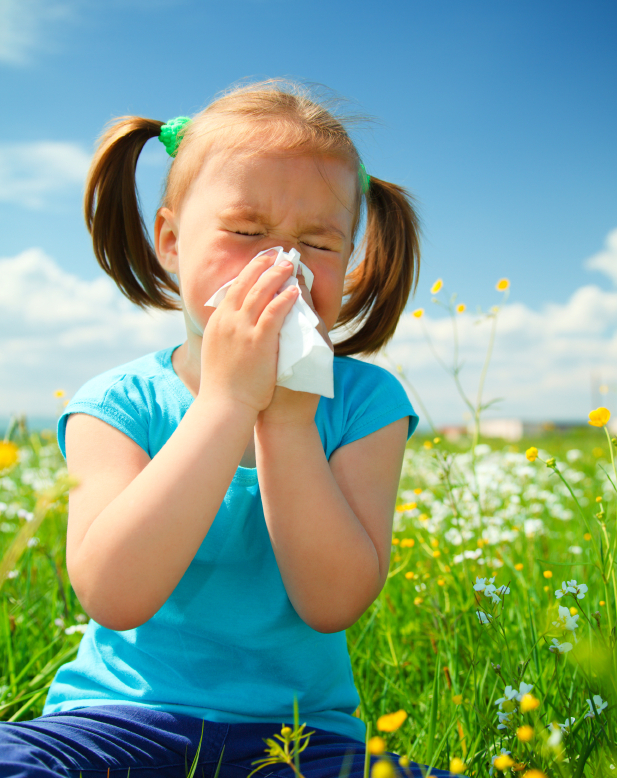 Similar to other types of allergies, the ideal way to manage hay fever is to find out what your child is allergic to, and then avoid it. We realize this is sometimes easier said than done! To start with, many children are allergic to pollens and molds, both of which are found everywhere outdoors and cannot be completely avoided. As a parent, you can help to limit the amount of outdoor pollen that enters the house by: closing windows and using the air conditioner, showering and changing clothing as soon as children come inside at the end of the day, and making sure that sheets and pillowcases (bedding) is dried in a dryer, not outside on a clothes line. In addition to outdoor allergens, there are indoor ones at hand, including dust mites or indoor molds. While they are almost impossible to eliminate completely, they can be kept at low levels when certain changes are made. Your child is also going to run into indoor allergens and irritants while away from home, such as at school, camp, or at a friend’s house. Dust can irritate the nose, throat, and eyes, and it can also contain allergic materials. A major cause of allergic symptoms has been traced to dust mites, tiny creatures that, like Dr. Seuss’ Who’s Down in Whoville, make their homes among dust specks. Dust mites live wherever humans live, and help clean up after us by eating the worn-out skin cells that every human sheds daily. They also thrive on tiny fungi that flourish where the relative humidity is high (70% or more). Dust mites go where food is plentiful, and are especially numerous in beds, pillows, upholstered furniture, and rugs/carpets. What can parents do to reduce dust mites? Use allergy-proof covers on mattresses, box springs, pillows, and cushions. These zip-up covers are available at most retailers, or through catalogs and online. Choose pillows and blankets that are made of synthetic material. Dust mites can survive in warm soapy water, so wash linens weekly and other bedding (like blankets) every 2-3 weeks in hot water, then put them through the hottest cycle of clothes dryer. Keep clutter and bulky fabrics out of your child’s room. If possible, floors should be wooden, tile, or vinyl – anything but carpet. If you prefer rugs for comfort, use small throw rugs that can be washed weekly in hot water. Curtains should also be easy to wash.
Keep horizontal surfaces to a minimum. Picture frames, shelves, books and other ornaments collect dust. All surfaces like dressers and other furniture should be easy to wipe clean. Avoid humidifiers and vaporizers – dust mites need humidity to live. Some areas may benefit from a dehumidifier, however if you use them you will need to empty the water pan and scour it daily. In the end, you can’t protect a child 100% of the time. Even if you were successful in eliminating more environmental allergens in your home, children still get exposed at school and at playmates’ homes. Following some of these suggestions, however, is a great first step towards reducing exposure.